if you enjoyed the website. Thanks! is named after Paul Gowen. 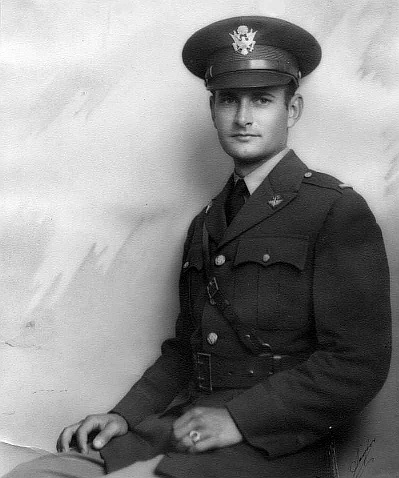 CRISTOBAL, Canal Zone (AP) Lieutenant Paul Gowen of Caldwell, Ida., was killed today and two other army men were seriously injured when a United States army bomber crashed and burned on the beach at Paitillo Point, near Panama City. Lieut. Kenneth Crosher, navigator, and Radio Private D. H. Bundy were badly burned, but were expected to recover. The bomber was on a routine flight from Albrook field when thick smoke stared to pour from its right motor a few minutes after the takeoff. Unable to gain altitude, Gowen headed the bomber toward the beach where it crashed among the trees and burst into flames. Bund and Crosher struggled from the wreckage but Gowen's body was trapped in the burning plane. Lieutenant Paul R. Gowen, former Caldwell resident, was killed today when his army airplane crashed on the outskirts of Panama City, according to telegraphic information received here by the young man's father, J. B. Gowen. The meager information did not state the cause of the crash, relatives of the officer said. Young Gowen is survived by his widow, the former Miss Betty Wilson of Twin Falls, and a small daughter, Stephanie, who have made their home for the past year in the Canal Zone where Gowen has been stationed; his parents of Caldwell; two sisters, Mrs. Robert Walker of Caldwell and Miss Daphne Gowen of Lewiston, Ida. ; three brothers, William Gowen of Boise, Justin Gowen, who is on a leave of absence from Poland where he is an American representative of the Anaconda Mining company and Ralph of Twin Falls. Arrangements for the funeral were not made this afternoon. The young officer was educated in the Caldwell public schools and received an appointment to West Point following his graduation from the University of Idaho. Upon receiving his commission from the United States military academy he was appointed to the air service and has been acting in that capacity for the past several years, having served in Louisiana, Oklahoma and the Canal Zone. He was 29. Funeral services for Lieutenant Paul Gowen, army flier who was killed Monday when his plane crashed at Panama City, will be held here, relatives of the young man announced today. Definite arrangements, however, it was stated, cannot be made until the arrival of the officer's widow and small daughter, Stephanie. Mrs. Gowen and the little girl are due to arrive by plane in Boise Sunday, relatives said. Lieutenant Gowen, a former Caldwell resident, was the son of Mr. and Mrs. J. B. Gowen of this city. He attended the local schools, was graduated from the Caldwell high school and the University of Idaho and was a West Point man. The bereaved family and sorrowing friends of Lieutenant Paul R. Gowen, brilliant young army flier who was killed when his plane crashed at Panama City July 11, will pay their final tribute to the former Caldwell youth Wednesday afternoon at 2:30. A special military service will be held at the Peckham chapel with the Rev. Robert Schrock, district chaplain of the Idaho Civilian Conservation corps, in charge. Pallbearers will be Idaho national guard members who were former friends of the officer. Burial will be in the Canyon Hill cemetery. Lieutenant Gowen is survived by his widow, the former Betty Wilson of Twin Falls, who flew here from the Canal Zone with her husband's ashes; a small daughter, Stephanie; his parents, Mr. and Mrs. J. B. Gowen of Caldwell and a number of sisters and brothers. An impressive military service paid final tribute today to Lieutenant Paul R. Gowen, who was killed July 11 when his plane crashed at Panama City. The Rev. Robert L. Schock, a chaplain of the United States army, was in charge of the rites performed at the Peckham chapel here. A Firing squad from Caldwell headquarters troop, 116th cavalry, Idaho national guard gave the military salute at the Canyon Hill cemetery where the young flier's ashes were buried. Pallbearers were Major C. V. Martin, Major R. S. Clore, Capt. Lee R. Clemons, Capt. Stewart S. Mazey, Capt., Carl Isenberg and Lieut. N. T. Hinds, Idaho national guard officers and friends of the former Caldwell boy. 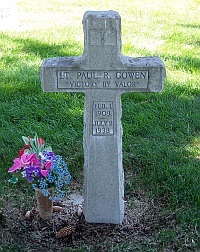 Lieutenant Gowen, who was the son of Mr. and Mrs. J. B. Gowen of Caldwell, was a graduate of the local high school and the University of Idaho. Upon finishing at the state university he was appointed to the United States military academy and four years later received his commission in the army air service. Besides his parents the young officer, who was 29, is survived by his widow, the former Miss Betty Wilson of Twin Falls; a small daughter, Stephanie and several sisters and brothers. Full sized headstone photo available upon request.